A door says a lot about a home. Do you prefer an elaborate or modest design? Modern or traditional? 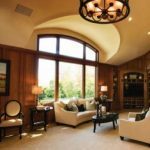 Arched or rectangular windows? No matter your final decision, any option you choose will stand as the grand entryway to your castle. Welcome your family, friend, and guests through an entryway that prepares them for the comfort and hospitality lays inside. When you close your door after entering or leaving, you want to know that your home is protected from dirt, debris, weather and water. By choosing Renewal by Andersen of Southeastern Mass and Rhode Island, that knowledge comes standard. All of our doors are sealed with our innovative Fibrex™ material to create the tightest seal possible to keep harmful elements out. Every replacement door for Massachusetts, Rhode Island, and the surrounding areas are built for durability. Step onto your patio through one of our hinged, sliding, or French doors to enjoy the bright sunlight or subtle moon and starlight around you. 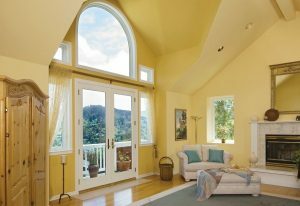 As you sit in your kitchen or parlor, enjoy the wide view of scenic beauty offered by your new door. Close out the cold from you warm interior when Jack Frost comes knocking. Seal in your cool climate when the sun is beating down on your door. Every Renewal by Andersen of Southeastern Mass and Rhode Island door is energy efficient to save you money year round. When pleasant days come around, open your doors wide to bring in the cool, fresh breeze. The first step never felt easier through one of our top quality doors into your home. When you go to sleep, sleep easy knowing your door locks out any harm to keep your family safe and sound through the night. Protect your home, welcome those close to you, and enjoy the weather when you want. Call us for your Massachusetts replacement door needs.